Privacy Package: Offers comprehensive protection for your computer and completely secures your online privacy against hackers! 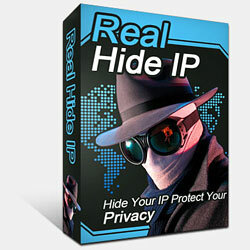 Real Hide IP: Hide your IP to protect your privacy. Real Clear Cookies: Wipe cookies clean off your computer. Real Clear History: Quickly clean all history of your web browsing and computer use. Hide IP forever without limitations. Immediate Serial Number sending, once the order is successfully placed. * Real Hide IP can be installed and used on only one computer exclusively by the user who purchased the license.